Is there a sequel to Somebody's Baby with the 2 attys? There is, Pat, called SOMEBODY'S LADY. The final book came out a few years ago; it's SOMEBODY'S HERO and features Tyler, a witness in the case Zachary and Liz handle in SL. hi Marilyn! i'm now reading the HEARTBREAK CANYON serie and i'm wondering will isabella get her own story? I honestly don't know. I really liked Isabella and thought she had some interesting tales to tell. 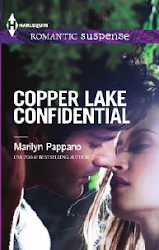 Right now, though, I'm in kind of a time crunch with the Copper Lake series for Harlequin and the Tallgrass/Tuesday Night Margarita Club series for Forever Romance. Wish I had an extra twenty hours every week where I could write whatever catches my interest. Who needs sleep? Hi, Marilyn! I was looking at your comments and I am so confused! I have Somebody's Baby and Somebody's Lady (with Zach and Beth), but who is Liz? Also I keep track of authors books and series by going to fictiondb.com and someone listed The Overnight Alibi as being part of the Southern Knights series. Is it? Thanks for so many hours of wonderful reading. I have Heartbreak Canyon series, too. All 3 sets are on my bookshelves and I can reread them anytime! Aack, Cathy, my mistake! The heroine in Somebody's Lady is Beth. I can always remember Elizabeth, but then I forget whether she goes by Liz or Beth. I love hearing that you reread the books. That's the greatest compliment a writer can get! Hi Marilyn, I have asked on other sites, but it can't hurt to see if you have any plans to add more to the Bethlehem Series? It continues to be one of my favorites, I re-read the books in order annually. It would be nice to see it expanded to include more books, perhaps with some culturally diverse characters? The series is so well written, it would be great to be able to add some love interest from different cultures.